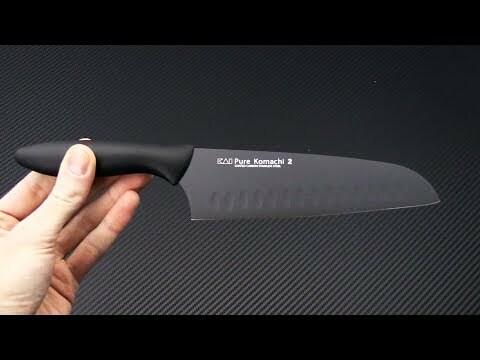 KAI Pure Komachi 2 6.5" Hollow-Ground Santoku Black with matching resin handle. Each knife in the Pure Komachi 2 line features a bright and unique color code to prevent cross contamination during food preparation. The handles are ergonomically designed for right or left handed use. Includes a color matched plastic sheath to protect the blade when not in use. The Blade: High carbon stainless steel pairs with the modified Sheepsfoot blade that defines the Santoku knife. Hand-sharpened to a 16° cutting angle on each side, just a simple push cut makes quick work of most any vegetable and the upward angle of the blade toward the point makes the knife excellent for slicing, dicing, and mincing. The hollow ground into the blade reduce friction and allow the food being cut to fall freely from the blade for faster work. The razor sharp blade is food-safe coated for corrosion resistance and friction reduction to glide through food with ease. Although dishwasher safe, it is recommended to hand wash for prolonged life of edge and coating.